Now new year 2018 is coming, you want to be beautiful from hair to dresses and also need to save up some money for summer holiday, right? Now New Star published the promo code NEW5 for our clients. Use this code, you will get 5% discount off when checking out on our site(https://www.newstarvirginhair.com). Whatever hair products or quantity, the code could be applied. How to use this promo code? Please see photo below. Fill code 'NEW5' in Discount Codes form and then click APPLY Coupon button, then you will see the product price will be discounted. This code is valid from December 27th 2017 to January 31st 2018. This entry was posted in Big News on December 28, 2017 by leonzhang. There are a lot of hair companies that sell hair products, many of them claim that their hair products are made of virgin human hair, but sold at a cheap price, in my opinion, actually they are not selling the real virgin hair even their product names contain the two words "virgin hair", they are cheating you. Real human virgin hair products are sold at a high price, because the hair is cut from single one donor and completely unprocessed, not everyone is able to buy virgin hair, so, here comes the question, how to get free virgin hair? Under such high competitive hair business, it is easy to get free virgin hair because every hair company competes with each other to take over more market share, some companies offer free samples, some will hold giveaway in their social medias such as Instagram to give free virgin hair as prize. These are all free ways for you to get the best virgin hair, you do not need to pay, just follow their Instagram or Facebook to participate the giveaway events they held. New Star offers two great ways for you to get free virgin hair. 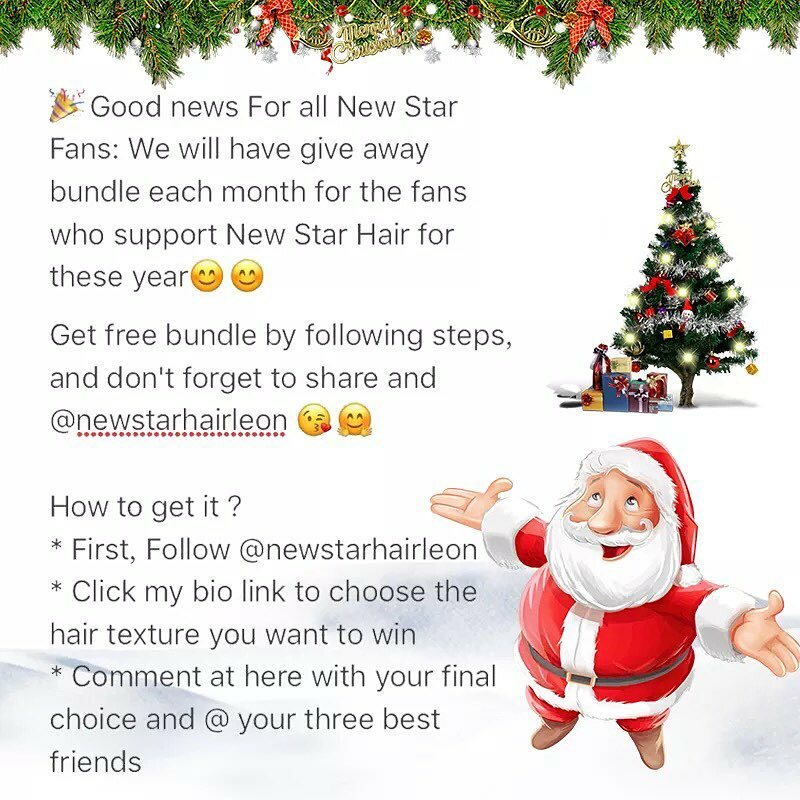 First, we will hold giveaway event on instagram page(@newstarhairleon) each month, you can follow this instagram account to participate the giveaway and then win free bundles, usually the prize will be three straight or body wave bundles, or other hair textures, in inch of 14, 16 and 18. 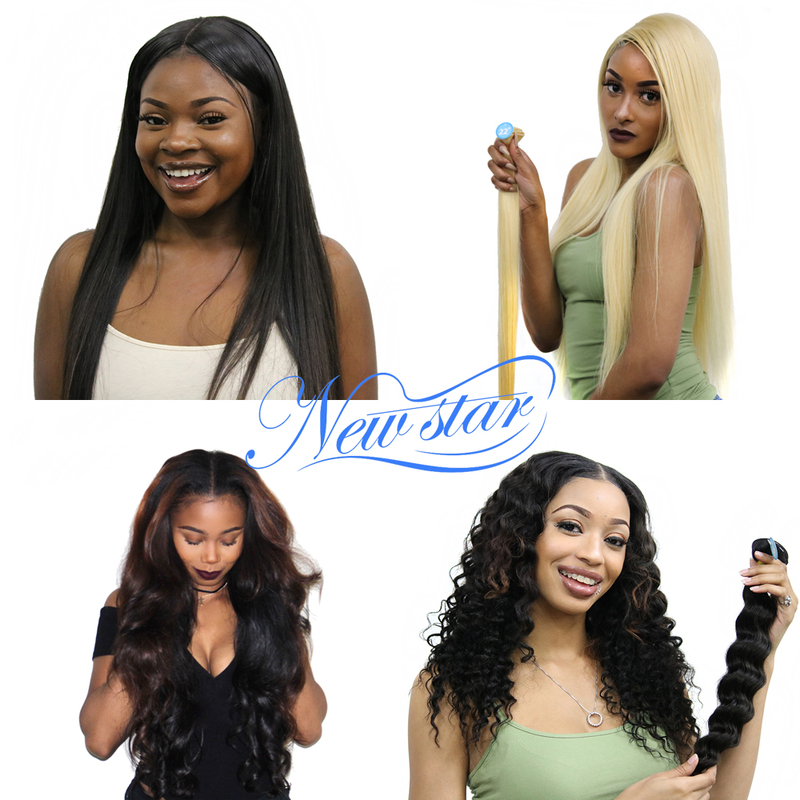 As you know, three bundles are very enough for you to make a full hair appearance because these bundles offered by New Star are made of real virgin hair. 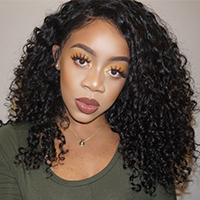 Second, New Star will send free virgin hair to online celebrities on Youtube or Instagram each month, these celebrities will be invited to use our hair and after wearing, they will give an honest review. If you have a great amount of audience on Youtube and your channel is mainly on hair, makeup and fashion reviews, please contact us. We will send the hair you want to review. 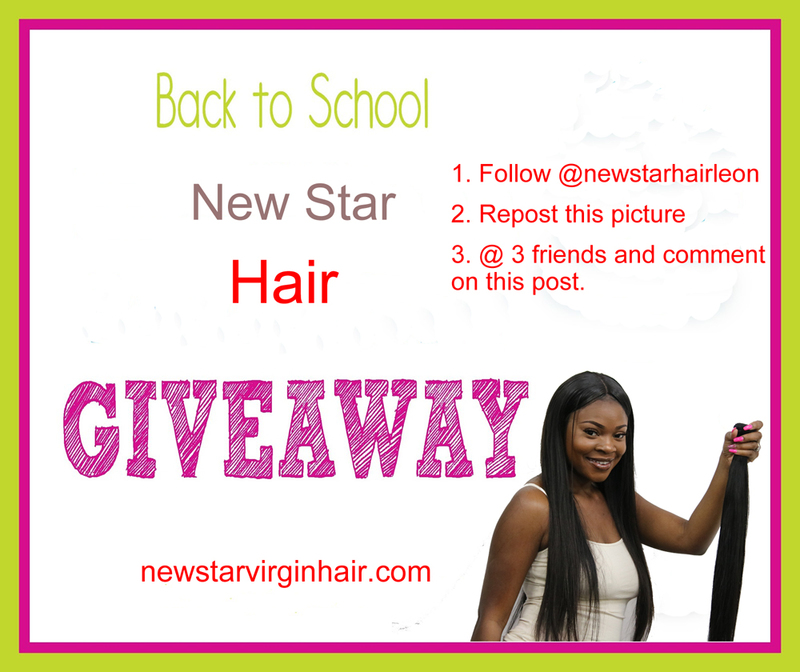 These above are two main ways for you to get free virgin hair from New Star hair company. By the way, free samples offered by other hair companies is another way for you to get free hair, but I can not guarantee these samples are real virgin hair. This entry was posted in Big News on December 21, 2017 by leonzhang. Summer is a great time for ladies to show their perfect figure on the beach. Well, besides bikini, beautiful dresses, sunglasses and other single products, you also need one head of beautiful long hair to appear on the beach beautifully. With those virgin hair bundles offered by New Star, long and full hair style will no longer a dream for many girls who have thin hair. Now, New Star is holding a big discount activity for the August summer vacation, all hair will enjoy 10% discount off on bundles, wigs, closures and extensions. This entry was posted in Big News on August 16, 2017 by leonzhang. Now the back to school season is coming, have you prepared gift for yourself or the most dear friend? If not, then why not try our human virgin hair weaves, wearing our hair will not only give you a natural and full hair appearance, but will also represent your beauty in front of your classmates. Real human virgin hair is a little expensive and beyond many people's affordability, but here is a chance to win at least 3 bundles, yes, this activity is sponsored by New Star Hair, 3 bundles are very enough for you to make a full hair look. Follow the rules displayed on the photo below to attend the giveaway, then you will have a big chance to get those bundles prize. The giveaway will end on August 10th. Besides, all hair products on our site will be discounted to be 12% off from August 3rd to 10th. This entry was posted in Big News on August 1, 2017 by leonzhang. 2017 summer is coming, now a new season should come with new hair colors. But what hair colors will be popular in 2017, let's see. Beautiful golden blonde hair is perfect for 2017 summer. 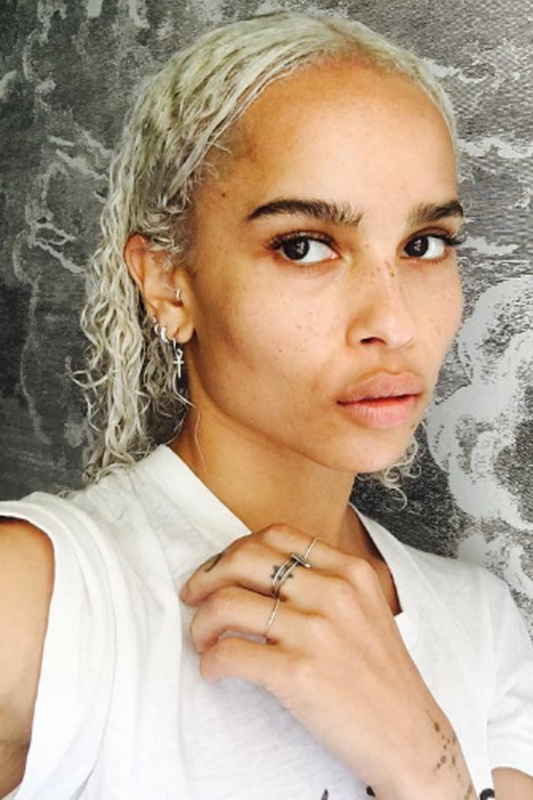 It will be a great change from your dark brown hair in winter. Add both lowlights and highlights to your hair with New Star #613 hair extensions. This color is perfect if you do not want a dramatic change of your hair. The dark chestnut brown features a little red hue that brings natural glow, it is easy to achieve especially if you have a red undertone. This hair color is perfect for redheads, the copper hue in the hair works perfectly with pale pink skin. Chocolate brown is great and a good hair color for summer 2017. Instead of going to try lowlights, yo can choose to complete with the bright hair color. Kendall Jenner trys a nice tan and dark brown hair, it is a great combination. Honey hair has a lot of shades, it is neither blonde all the way nor brown. Honey hair is a combination of light brown and blonde, in the summer, choose a bleach blonde and chestnut brown. Honey hair suits everyone because it is versatile. Need to stay fabulous? This hair color is for all daredevils. Platinum blonde is considered to be a perfect summer hair color. 2017 is full of bold and bright hair colors, it is said to be the trend in this season. This entry was posted in Big News on May 9, 2017 by leonzhang.